ThinkEd: The ivy-clad ceiling – UE or not UE? Well. Which story exactly? The story about the huge increases in university graduates that the western world lusts after. 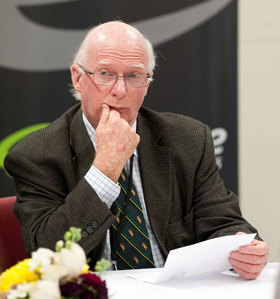 New Zealand has been looking at NCEA and questions around Unit Standards and Achievement Standards as part of the ongoing evolution of NCEA as the central school leaving qualification. School leaving qualifications are asked to fulfill a number of functions. They provide the means for post-secondary education and training providers to assess the right step on the ladder from which a student can with confidence continue their journey through to postsecondary qualifications, they provide employers and community with information on a student’s success in the school system and they serve to motivate students as they develop a “moving-on-to-what-comes-next” focus for their senior secondary schooling. In amongst this variety of purposes, University Entrance is but one and it would be a backward step if in trying to get UE into a form that exactly meets the various purposes of the universities and in so doing NCEA is distorted in its usefulness as a qualification and is diminished as a goal for many many students due to its inapplicability to their future. Students undertaking NCEA should be headed in a variety of directions – some to university, some to ITPs, some to PTEs, and others to employment and on the job training. NCEA must remain a flexible qualification that meets all these needs. A real issue to be addressed is the fact that like other education systems, we arein New Zealand inarticulate about just which skills and knowledge students need if they are to admitted into the academy. In New Zealand in the olden days (i.e. prior to the 1990’s) there were no curriculum statements for senior secondary schooling. Teachers taught to the examination syllabi for University Entrance in the sixth form (Year 11) and the University Bursary / Scholarship examinations in the Seventh Form (Year 12). Of course this did not mean that that there was necessarily a connection between what was taught and what was required in university study. The qualification called “University Entrance was an aggregated one and only in selective courses at the university was attention paid to which subjects had been studied and their connection to the enrolments of aspiring university students. I was involved closely in English as a school subject back then and it was all a piece of theatre of the absurd. The syllabus was set by the University Entrance Board (increasingly with involvement of the school sector), students would study it, sit the examination and get or not get their University Entrance if they could muster four (English and three other subjects) above 50%. Then it didn’t matter a fig whether or not they had done well in English if they were going to enroll in it at the university. Nor did performance in English count for much in most of the other University subjects except, as I said, in some of the selective courses where specific subject were required and perhaps even to specified levels. The use of examinations in the school system is both a good thing and a bad thing. It is good because it avoids the orgiastic testing outside the school system that characterises the United States and the UK micro-focus on O levels and A levels (although the breadth of subjects in that system is to be admired). But it really is a problem when one use of school achievement markers is to be used for multiple purposes. It is slowly dawning on us that the single focus on university study is serving neither the community nor the students well. As the importance of multiple pathways becomes increasingly apparent, it is critical that the approaches to the terminal qualifications of the schools system are not out under a pressure to be single pathway oriented. If defining “University Entrance” is to become a constraint on giving focus and meaning to multiple pathways in secondary schools, then the greater good must prevail – university entrance should be removed from the school system and become a matter for universities to deal with. That would be a bad thing to the extent that it could trigger a USA-style approach. But it must be said that the distortion of the secondary school programmes by the needs of the universities and to the detriment of so many students whose success lies in different pathways has gone on too long. As the school curriculum is opening up rapidly, the development of any list of privileged subjects would be a very backward step. It would also fly in the face of what is known about preparedness for university. The considerable body of work undertaken in the USA on this supports the view that it is less about the subjects studied but rather more about the characteristics of the programmes and the learning experiences within them. “College knowledge” is less about the detritus of subject information and bits and pieces of knowledge (the importance of this is not dismissed entirely) but about a set of characteristics as a learner that will stand the learner in good stead in a post-secondary environment. Qualification could easily have been improved through simply setting out what universities want – if they indeed know with any degree of specificity what it is that they want. Their rather narrow concerns should not drive the overall shape of the school leaving qualification which must serve a wider group of students. Perhaps those involved in the review of NCEA should reflect on the fact that what they have been doing hasn’t been working in terms of admitting through the ivy-clad gates, students who can succeed in the numbers that we would wish. Widening the criteria rather than making the gate more narrow might well be a direction to head in. It is clear that the Government has been thinking – thinking about tertiary education and value for money and issues around success, failure, pathways and all that. First we had tentative comments from Minister of Tertiary Education Hon Stephen Joyce about success and failure and whether finding could be related to some measures in that area. It is bound to happen eventually and discussion should focus within the sector on how best and most intelligently it could be achieved rather than any crude dismissal of it as an abrogation of the rights of tertiary education institutions and the students within them to fail at will. Then Minister Joyce made a suggestion that perhaps tertiary education should be about getting a job and that funding could be directed more successfully to courses that had a clear link to employment. This is in line with a view developing in other countries that tertiary education (and high school too for that matter) is not just about graduation but about a career and employment. Responses to this suggestion were more muted other than the from the student leader who stated with as much firmness as he could muster that “We come here to learn not to train.” I might have thought that at a university you were very much being trained in the academic disciplines of thinking, expression and research. And if the Minister wasn’t raising this issue in this way, what might we be getting? Well look around you and see what is happening in other countries. Australian educators will be pleased that Julia Gillard has been kicked upstairs by the Labour Party. After all, it can’t be much fun having an Education Minister who exhibited so much joy in lurching towards strange goals for tertiary education. The Australians have set a goal of having 40% of all 25 to 34 year olds with a bachelor degree or above by 2020. This must have sent shivers down the spines of education leaders at all levels. But Australia is not on its own. In keeping up the tradition among the Group of Five English-speaking Education Systems of aping each other regardless of common sense, they join the United States of America and Great Britain in setting this arbitrary target that takes little account of current performance and the reasons for it. The British set a target of 40% (a key recommendation of the Leitch Report) and more recently President Obama has set a target that the US would simply have the highest proportion of college graduates in the world by 2020! Both countries will not get within a country mile of those targets given the performance of their K-12 education systems for a start and because of a number of other factors. Reaching such startling increases in graduating students would require huge increases (reportedly 70% in Britain) in the number of students who start a post-secondary qualification. That is because the attrition of tertiary students, a factor that has been stable and persistent over 60 years, sees that only 50% of students who start a post-secondary qualification actually complete it. So a target based on completion will also require targets for increases in the numbers entering post-secondary education and these will need to be greatly ahead of where they are now. Can any of the K-12 education systems deliver? Probably not and certainly not without huge changes and greatly increased expenditure within the school sector. Other increases in expenditure reported as required to support the British rush towards its 40% target are an increase of 18,000 additional staff and billions of dollars for capital work. The first university to successfully breed pigs with wings could be on to something. In the US, President Obama claims with great modesty that their goal of wanting to be in global first place in the college graduate stakes is more faint hope than attainable goal. I have just returned from the US. It generally accepted that disengagement from secondary education in the English-speaking world is running at 20%, I was told time and time again that in this US state and that US state the figure was easily 30%. But having little regard for the real issues of quality K-12 education, Obama modestly places his goal alongside other wonderful achievements of US education such as the GI Bill and Truman’s Commission on Higher Education. The first turned the nightmare of the Second World War into the American dream of a college education while the second doubled the number of community colleges which became so central to making it seem that the dream was attainable by all. I would like to see much more emphasis placed on two other goals if attaining the goal of increasing the completion of a post-secondary qualification let alone a university degree is to be attained. The first is genuine access to two years of quality early childhood education (15 hours each week) which is recognised as the first of three key educational dots that need to be joined together. The second dot is the completion of secondary schooling (i.e. the attaining of the high school leaving qualification). If both these dots are joined then the third, the completion of a post-secondary qualification, is more likely. The completion of a post-secondary education is the third and critical education dot that if joined to the previous two will ensure advantage in life. But this third dot emphasises the importance of a post-secondary qualification not necessarily or exclusively a bachelors degree qualification. In recognizing this, the US administration has taken a more realistic path towards their goal in recognising that community colleges and career and technical education have a central role to play in any targets that it sets. A well-educated country is one which has a complete array of citizens qualified at all levels from low skilled employment (yes, that will always exist) through technician positions right up to the most brilliant researchers and scholars. The issue with the lurch towards bald targets for graduates is that the country that focuses only on reaching the latter and ignores just how students will get to start such a course and then to complete it could well end up killing itself by degrees. Let’s talk goals, let’s talk about funding success, but let’s do it sensibly. Internationally the focus is intensifying on retention of students in programmes in both tertiary and secondary programmes. That stubborn statistic that tertiary education systems in the English-speaking world are unable to budge is starting to be of interest to the funders of systems that have become more permissive in terms of access and the kinds of programmes offered while mechanisms for funding of secondary education are facing an overhaul. It remains a truth that about half of the students who start a postsecondary qualification actually complete it. Now before blood pressure lifts in response to this, it has to be kept in mind that this is true of tertiary education in New Zealand, Australia, Canada, the United Kingdom and the United States of America. This cannot be about the competence of tertiary providers in all of those countries, the issue cannot be simply one of standards; the issue must lie in a complex set of features of those systems that result in this. And remember too that this statistic has sat there for 60 years unchanged. An excellent study of this in New Zealand shows that 40% of students will have completed their qualification five years after starting while 9% were still working towards it – 51% had left without completing. The figures for students starting their first qualification were not quite as good, 37% completed and 57% left. The figures improve as the level of the qualifications lift from certificates (30%) up to Masters (59%). So the current attention being given to funding for performance raises some very important issues. How is this to be measured? The international literature is clear – the most critical progression is from Year 1 to Year 2. Institutions that are able to lift their rates of progression at this level will in the end have higher overall statistics for completion. So a clear focus on Year 1 to Year 2 progression would seem to be best. I am surprised therefore that New Zealand is looking at making this less clear and intending to somehow aggregate progression at whatever level it occurs – Years 1 to 2, 2 to 3, 3 to 4 and so on. This shift in focus from attrition to retention removes any notion that there is a reasonable time in which qualifications should be completed. Aggregating retention figures and in so doing obscuring attrition rates will help no-one. It might also make less clear just where attrition / retention issues are at their most critical – Year 1 to Year 2. It could be that paying attention only to the Year 1 to Year 2 progression rates is a sharper means of effecting improvement. It also provides a clearer focus for institutions, something to aim at and know to what extent improvement is happening. Later when that indicator is lifted, attention might shift to overall qualification completion rates. Lifting Year 1-2 progression rates will in fact inevitably see that completion rate rise. A further reason for putting the attention at the front end of postsecondary courses is that it will encourage much greater care with selection of courses. Is this student in the right course? Do they know what is involved, what will be required of them? It will also lead to much clearer thinking about what constitutes an adequate preparation for the chosen programme. This means not only that a tertiary provider will have to be much more articulate about the requisite skills and knowledge required for students entering a programme but also that they will need to do something about monitoring the incoming students, spotting weaknesses early (probably in the first two weeks) and responding to them. It will also place some added responsibility on secondary schools who, on the basis of better information, will be able to better prepare students for the pathway they are choosing. The secondary school has a clear role in the successful transition of students from that level into tertiary education. So will the proposed quarterly funding of students in secondary schools help? Well, it all depends how the money saved is used. Assuming that secondary schools can cope with the added sophistication of planning for a shifting (and in many cases diminishing) resource base, the difficulties of this should not be underestimated, there could well be an argument for closer tertiary / secondary co-operation where students planning to leave are offered transition programmes in the secondary school. In essence they could make a decision to leave school but stay in the school and work towards the transition. The key factor for a school under this new funding regime will be stability of the school roll. I believe therefore that the winners and losers under this new approach will not be as some people expect. Many low decile schools have rolls are pretty stable and the biggest impact could well be on middle decile schools where rolls are more volatile. Regardless of the impacts of these various changes one thing is clear. It will no longer be that case that no-one is responsible for student progression. Schools will be encouraged to retain students while the tertiary providers will similarly have to see retention as the most important measure of success. And at long last, completion within a reasonable time will be seen as a sound goal. All this will require sound performance at all levels – early childhood education helping get little ones ready for school, primary schools that deliver students to secondary schools ready to face work at that level, secondary schools that sharpen the focus on those skills and start the transition to postsecondary qualifications and tertiary providers that deliver the goods – completed qualifications. And all that should be done within a reasonable time but that is another issue.